ISAAC's main, technical objective is to design, build and demonstrate the function of two free-falling units with one of them always tracking the other. A light source on the ‘target’ unit will allow the ‘tracker’ unit to find the target. Both units will be spin-stabilized and the tracker will have a despun part with a mechanically actuated mirror to allow a two degree-of-freedom control. So what are the two degrees of freedom? 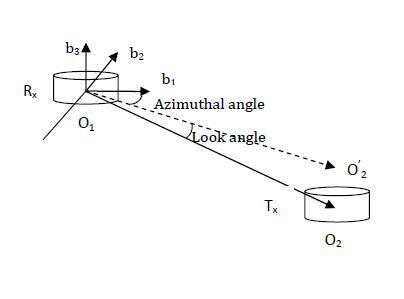 The two degrees of freedom are look angle and azimuth angle, perspectively, as showed in the below figure. The look angle is the angle between the disk plane and the direction to Tx from Rx to Tx in Rx body frame, and the azimuth angle is the angle between the projection of the direction to Tx onto the b1b2 plane in the Rx body frame and the b1 axis of the Rx. For now, we have derived the expression of the two angles, and simulated them. The result is illustrated below. The reason for them are kind of complex. 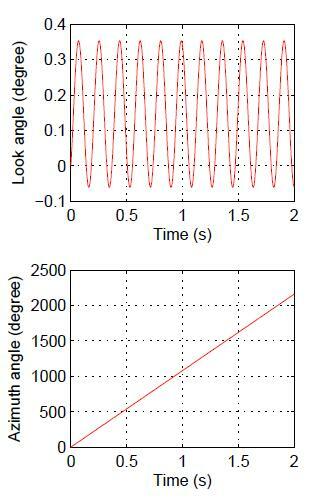 Due to the lateral angular rates, there is wobbling. There is a visual presentation on the website http://www.ifmo.ru/butikov/Applets/Precession.html. More analysis on the reason is proceeded.